I think I have a new addiction. And that addiction is called Pokemon Duel. For whatever reason, this mobile (iOS and Android) game was released in some 60 countries outside of Japan with almost no fanfare, despite being, by all accounts, quite popular in its homeland, where it has been available for a while. You would have thought that after the lighting strike of success that Pokemon Go enjoyed, every developer working on a Pokemon game for mobile would be trumpeting it to any and all who listened. It’s a pity that didn’t happen in this case, because Pokemon Duel is utterly brilliant. 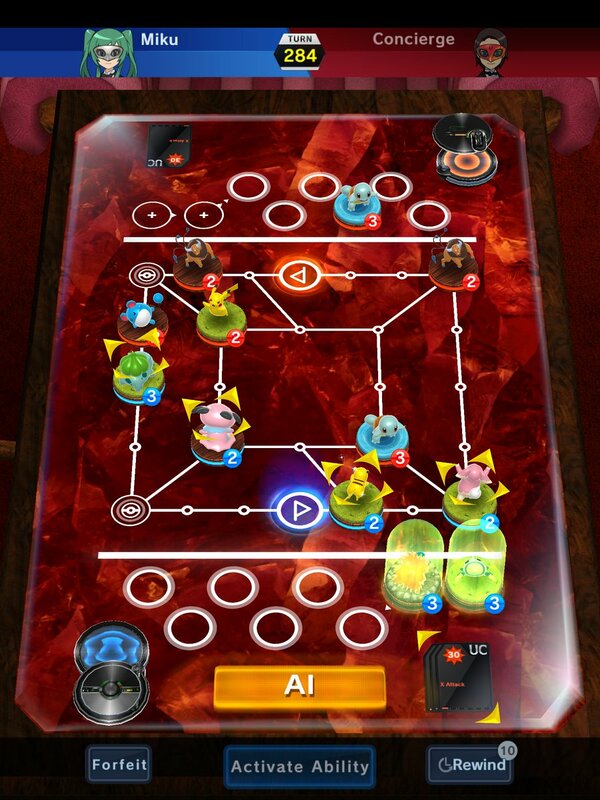 It’s a competitive board game for two players, in which each player has a “deck” of six Pokemon figures, with the goal of taking turns to maneuver their figures over a small grid of spaces to reach the other player’s goal. The first player to step a pokemon on the goal wins the match. 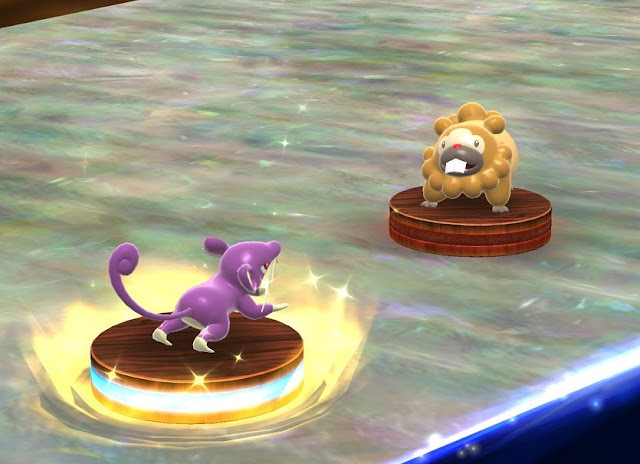 Of course, pokemon that run into one another on the board can battle, and when that happens each pokemon spins a wheel. This wheel has been split up to represent various different attacks, and when the wheel stops spinning, whatever the spinner is pointing to is the attack the pokemon will execute. Some attacks do straight damage, while others might poison, paralyze, or push the pokemon around the board. 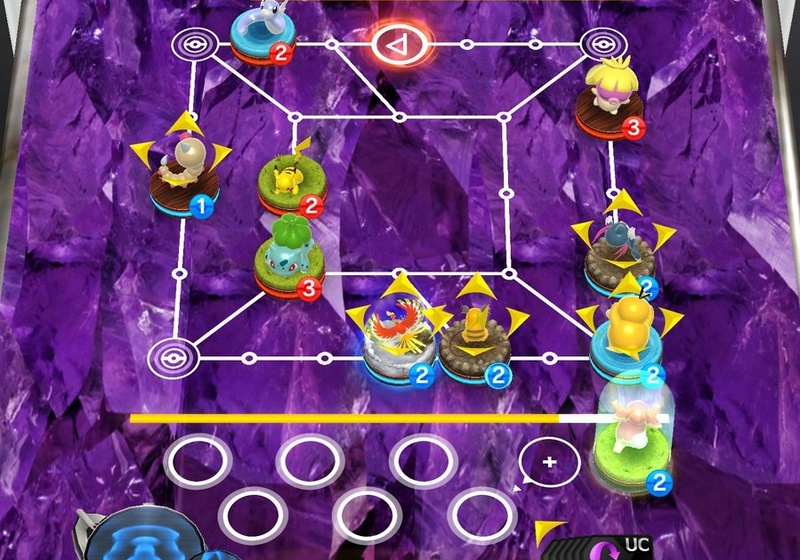 If a pokemon succeeds at damaging its opponent (more than its opponent damages it), then the opponent pokemon is removed temporarily from the board. If it’s a draw, neither pokemon moves. If one pokemon would cause damage to a pokemon, but the other pokemon has instead ‘rolled’ an effect like poison, then the attacker loses, but is not removed from the game. Instead, they have the negative status placed on the pokemon, which affects future attacks. Different pokemon have different abilities. Some are good at dealing raw damage. Others are good at inflicting one (or more) negative statuses on opponents and weakening them. Still others are fast, making it easy for them to dodge away from enemy pokemon and sneakily reach the opponent’s end goal without actually getting into a fight. The variety among the 220-odd pokemon in the game so far is so extensive that building a balanced party of Pokemon is as addictive here as in Magic the Gathering, Final Fantasy CCG, Hearthstone, or any other CCG that I’ve ever played. But what has most impressed me about the game so far is how important skill is for victory. You could load your team up with rare pokemon that you spent a fortune in real money to acquire (as with all free-to-play combat games, it’s possible to earn “booster packs” that contain pokemon slowly, or spend real money to get them more quickly), but you’ll still lose to a team of really basic pokemon if the other player really understands the strategy of the game and knows how to use his or her pokemon better. I’ve already come across players in the multiplayer with very high ratings; implying that they have been very successful in the game, who were able to trounce me with a very basic mix of pokemon that have been pulled together in such a way that the pokemon complements one another perfectly. Conversely, I’ve overcome players with far better pokemon than I own using good tactics in turn. That said, there’s still a real desire to collect all the pokemon in Pokemon Duel, and then mess around with different combinations to try and give yourself the best possible chance to succeed. It also helps that the playing pieces that represent the pokemon are absolutely adorable. I want a physical version of this game just so I can pay a fortune to own all the figures. 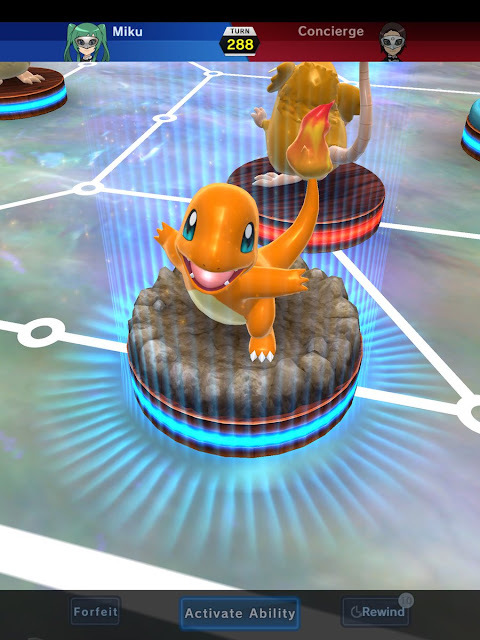 There’s a lengthy single player campaign, which you can use as a way to test out combinations of pokemon, and collect rewards (such as more pokemon) by winning matches. The story itself is even more throwaway than we see in most Pokemon games, but given that this is a free-to-play game, focused on multiplayer, that’s not really that surprising. The bulk of your time will be spent playing other people online. Matches are quick, and there’s no communication functions, so people have no way of misbehaving, making it very easy to get stuck into a loop where you can play one game after another and start to lose track of time. Each match contributes to your player rating, and then you’ll also regularly earn rewards for participating in these matches. Because there is that daily encouragement to log in and play a couple of matches (and that will only take you a couple of minutes to do), I suspect the community for this one will be sustained for quite a while yet. I also see it developing a strong competitive community around the game, because it is so supremely well balanced and tactical that there is a clear path to mastering the game, and, just as a chess grandmaster would trounce me at chess, so too will the top players in this particular game find themselves winners through skill, not through what they have invested in the game. There’s also so many different ways to play the game that there will be a strong metagame, and different players will become specialists in different kinds of play; some will play fast, aggressive games, others will focus on teams of pokemon that have high damage outputs, while others will play a more wily game, with the careful movement of pokemon and clever application of skills that allow them to out-maneuver and misdirect opponents. The only downside is that for some weird reason it’s not possible to create friends lists to challenge them to battles directly. Instead you need to create a “room”, and share that room code with your friend. At the conclusion of each game you’ll need to repeat the process. This is clunky and irritating; my wife and I are quite enjoying playing the game together, but not being able to instantly play a game for fun (or to test pokemon teams) has proven to be a weird decision by the developers indeed. I had no idea what I was getting myself into when I started playing Pokemon Duel, but this game may as well have been made explicitly for me. It’s a charming and pretty game, with a really accessible set of rules that means that even board game novices will know what they’re doing within a few rounds. At the same time, it has a near limitless depth and becoming really good at the game requires some genuinely strategic thinking. Depending on how this game is built on from its foundation in the coming months and (hopefully) years, I can easily see it becoming my favourite Pokemon game ever.